Wingate Alloys Offers Wear Resistant Solutions to Fulfill Any Requirement. 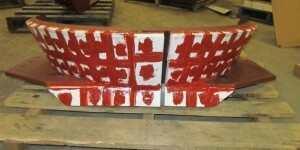 WINCO-TUF 40: Hi Strength Wear Plate designed for extreme abrasion and moderate impact resistance. WINCO-TUF 50: Ultra Hi Strength Alloy Wear Plate intended specifically for applications requiring a high degree of abrasion and wear resistance. WINCO-TUF 50 is a cost effective option for parts subjected to extreme levels of wear. CHAMPALOY is an Ultra-Hard, Impact and Abrasion Resistant Chrome Carbide composite. It offers the ultimate in wear resistant properties and specifically designed to handle the heaviest abrasion/impact applications. WINCO 600 HT PIPE is an extremely Tough, Abrasion Resistant Hardened Steel Piping System designed for coarse material handling. WINCO 600 HT PIPE is one of the most cost effective wear-pipes in the industry. WINCO MANG is a Non-Magnetic Alloy Steel that work hardens under severe impact conditions. WINCO MANG’s resiliency will prolong use and yield greater efficiency. WINCO SURF LINING – Abrasion and Temperature Resistant High Alumina Ceramic Lining. WINCO SURFCB LINING- Wear Resistant Fused Cast Basalt Lining for Friction Induced Abrasion. CERAMITHANE is a combination technology for material transfer and multiple wear/impact benefits. It combines the sliding wear resistance of ceramics with the impact resistance of polyurethane.